Of Irish origin, the sculptor Patrick Macdowell made his career in England. He was the son of a Belfast tradesman, and found his first interest in art from his schoolteacher, an engraver. The family moved to England, and Macdowell was first apprenticed to a coachmaker, and then found his metier when he lodged in the house of P. Chenu, a French sculptor then resident in London. He exhibited works at the Royal Academy from 1822, and became a student at the RA schools rather later, in 1830. After some early success with portrait busts, he also produced some ideal works, early works including a Girl Reading exhibited in 1837, and a Girl Going to Bathe in 1840. Macdowell was elected ARA as early as 1831, and RA in 1846. 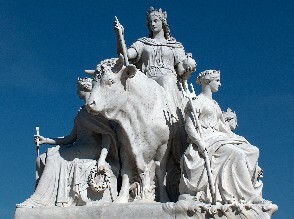 Among his notable successes were exhibits at the Great Exhibition of 1851, and being selected to create Europe , one of the four great groups around the Albert Memorial. 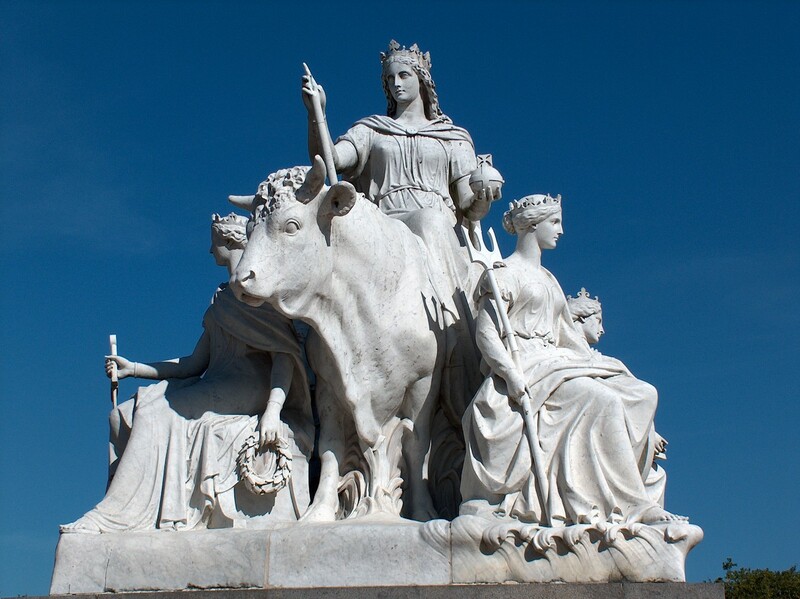 Europe , for the Albert Memorial . This group shows a very calm, almost archetypical Victorian Classicism. Yet if we knew Macdowell only from this one work, then we should be misled, for his the bulk of his oeuvre is not particularly calm. Nor did he even particularly favour sculptural groups - apart from the Europe , there is The Triumph of Love , a family group of a couple of draped figures, or rather undraped in the case of the man, holding aloft their infant son; also Virginius , with the noble Roman holding up his swooning daughter, about to cut off her head. But the majority of his work falls into two groups: portrait statues and busts, and the ideal girls alluded to above. To start with the portrait statues, Macdowell's chief works are Viscount Exmouth in the National Maritime Museum, Greenwich, William Pitt and the Earl of Chatham for Westminster Palace, Turner for St Paul's, Cuvier and Linnaeus for the rear of the Royal Academy's home in Burlington House, and Viscount Fitzgibbon , also known as The Young Hussar , for Limerick. In these he often tends to the dramatic pose, with a sideways gaze, and looking as if the subject was poised to stride into action. The Burlington House figures are less active, as is the figure of William Brown Bt for Liverpool's St George's Hall. Macdowell's ideal girls tend to the slightly oversweet, and are characteristically leaning or stooping, or partly supported rather than simply standing, the artist again favouring a sense of movement. As well as the Girl Reading and Girl Going to Bathe , we may mention Early Sorrow , Eve (in the V&A collection), Morning Prayer , and Daydream , and Leah in Mansion House, probably the best of them. Miniatures of some of these latter works were reproduced in Parian. Typical ideal figure by MacDowell .